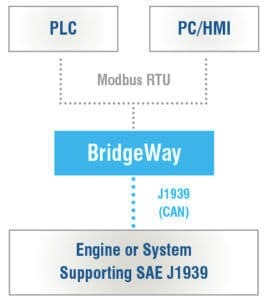 The BridgeWay™ J1939 to Modbus Interface Gateway (AB7606) provides connectivity between a Modbus RTU (RS485 serial 2 wire) network and a J1939 (CAN) network. The AB7606 operates as a Modbus RTU Slave device, allowing a Modbus RTU Master to read and write J1939 PGN data. 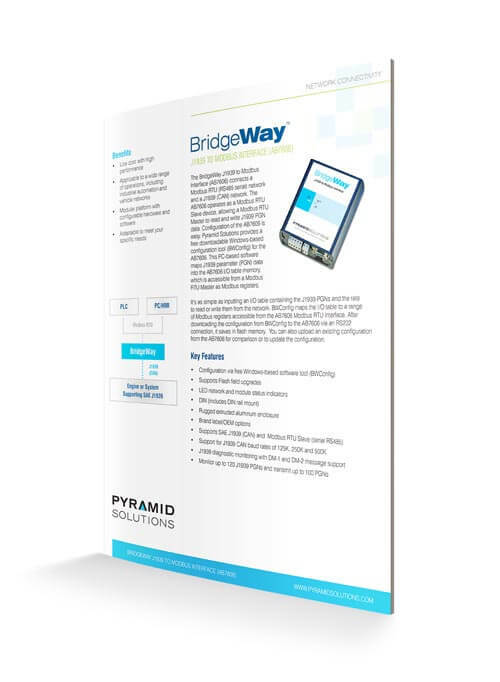 We provide a free downloadable Windows-based configuration tool (BWConfig) for the AB7606. 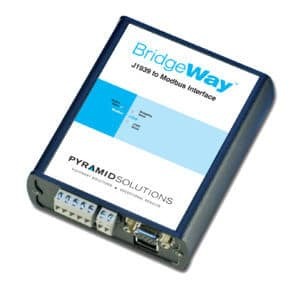 This PC-based software allows users to map J1939 parameter (PGN) data into the AB7606 I/O table memory, which is accessible from a Modbus RTU Master as Modbus registers. Configuration of the AB7606 is easy with BWConfig. It consists of setting up an I/O table containing the J1939 PGNs you wish to read or write, and determining the rate at which each will be read or written from/to the J1939 network. BWConfig maps the I/O table to a range of Modbus registers accessible from the AB7606 Modbus RTU interface. Users download the configuration from BWConfig to the AB7606 via an RS232 connection. It saves in Flash memory. You can also upload an existing configuration from the AB7606 for comparison or to update the configuration. Used to test Modbus Master connectivity and data mapping without using a PLC/HMI, etc. (necessary for integrating or troubleshooting an installation).